As the clock struck 12:30, clouds were pervading the skies over the Walter Johnson High School track. Some of the top young runners and eaters as well as various spectators from all over Montgomery County, the state of Maryland, and even the state of Virginia were present to watch the first event on the track, the Freshman/Sophomore Burrito Mile. Competitors gathered around the table for some last minute instructions from meet director and organizer Rafi Moersen: eat the burrito as fast as you can and then run a mile-that is four laps. And with a scream insinuating passionate excitement for all the chaos which was about to unravel upon the track, it all began. Having long-awaited this moment to return, excited spectators watched and cheered the competitors. 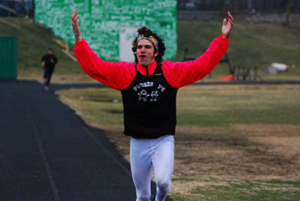 Approximately a couple minutes into the start of the race, Brendan Stepek of Gaithersburg finished his burrito and began running at a lethargic pace. He ran comfortably and unchallenged. He carried this pace through the first half of the race, and then began to slow the pace. 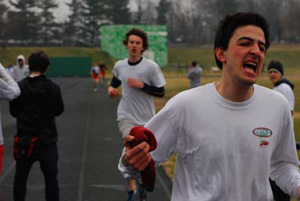 That is precisely when Walter Johnson Cross Country and Track sophomore runner Sean O'leary, who finished his burrito 2:45 into the competition, unleashed a red-hot performance. Even though Stepek is a respectable 4:50 miler, and had achieved a considerable lead over O'leary, the fiery red-head who is naive of opposition went out very fast with his eyes on Stepek the entire way. He very quickly began gaining ground, slowed down a bit due to his rapidly-paced start, and ended up catching Stepek within the first 20 meters of the third lap. He considered sitting on Stepek but then decided to not waste any time and pass him. O'leary would never look back and he cruised to a first-place finish-seemingly comfortably as he wore a proud smile on his face as he rolled down the homestretch. His mile time was 5:07, making his overall time 7:52 and some change. Stepek would hold on for second place. Rocky Balboa's "It's the Eye of the Tiger" played metaphorically as spectators and competitors patiently watched world record holder Cedric Dana walk onto the track. Moersen delayed the race about ten minutes for his arrival. He did not warm up because he knew he was not in any kind of shape to run a quick mile-any preparational running would be counterproductive in that it would fatigue him. As expected, however, he was in excellent eating shape, making the delay very well worth it. Dana was prepared and would not disappoint. Periodically supplementing his burrito with water, he managed to down the burrito in 1:06. Anxious, he went out at a quicker pace than he could handle-about 73 seconds for the first 400 meters. He slowed down progressively throughout the rest of the race as Bradshaw Kenimer did just the opposite. After Kenimer downed his burrito, the sub 4:20 miler from T.C. Williams High School in Northern Virginia took off with aggression. 100 meter stretch by 100 meter stretch everybody could see him gain ground on Dana. But, by the time he had just 100 meters to go, Dana finished in 6:53-meaning he ran his last three laps in 4:24. Kenimer easily held on for second place in 7:05. Though he came up short in his efforts, he exposed the world champ: despite the fact Dana has established himself as an incredible eater, he has slipped in the running aspect-which is half the battle. If you take somebody relatively close to Dana in terms of eating ability and a runner like Kenimer, then you arguably have a new world record. Nonetheless, the metaphoric "We are the Champions" played as Dana, fatigued and nauseous, bent over in glorious victory once again. He has yet to lose in a Burrito Mile competition. Third place was multiple time Virginia Private School State Champion Johns Ross of the Potomac School. He ran a 4:40 mile after eating his burrito in 3:47. The next and final event on the track was the 4x8urrito. In this event, one person from each respective relay squad eats a burrito, runs an 800 with the subsequent relay member's burrito in hand, then hands off that burrito to the next relay member and then the pattern repeats. Team Facial got out in front early thanks to a very strong effort by Walter Johnson Senior Ian Chow. He devoured his burrito in a mere 50 seconds which was easily the fastest eating split of the day. He probably also had, conversely, the slowest running split of the day. Nonetheless, Chow finished first and Team Facial would never look back. Team super-sophs, a relay squad also composed of solely Walter Johnson students including O'leary, led the charge to catch Team Facial. 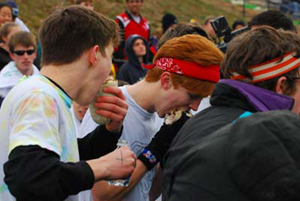 While the lean runners which composed Team Super-Sophs were far more dominant in the running aspect, their eating skills were only refined enough to help them finish in second place. While relays of four legs competed with each other, Andrew Palmer of Walt Whitman High School set out to do the job of all four people. Palmer had his mind set for weeks before the event to do something so unthinkable at the Burrito Mile by eating and running all four legs. As a testament to how competitive and determined Palmer is, he ignored all of the doubters. He raced the first leg and had a very strong start. However understandably, he slowed down at an exponential rate. After persevering past his stomach threatening to regurgitate all which he had eaten, he downed his fourth burrito. He knew that after running three 800's and eating four burritos, running one more 800 would not nearly be as much of an issue or challenge. Palmer gathered himself on the line and with the help of some eager friends who apprehend the insanity of Palmer's efforts, they came through the first lap. Palmer ran the second lap on his own and was able to keep his four burritos inside him-or maybe his stomach was so full of burritos that the food was lodged in his stomach and needed much more time to be broken down in order to be vomited. He finished with a look of great pride on his face for he has done the absolute unthinkable-something which only he thought could ever be done. Forever, Palmer's name will be remembered in the history of burrito miles. His 800 split was 2:27 and his overall time was 59:34. When asked how he prepared for this event, Palmer replied, "Training had been going a little slow, so my coach and I went for a late Home Depot run last night and exchanged my balls for a brass pair." I'd say, Mr. Palmer, your balls are made of steel, not brass, steel. Thanks to everyone who competed in this years Burrito Mile. And thanks to Rafi Moersen who spent many hours organizing this event. He helped raise over $3,000 to the Leukemia Lymphoma Society.